Lady Emily Foley built the school for the children of the Stoke Edith Estate, and retained a close interest in the School, remaining Chairman of the Governors until her death on 1st January 1900. When Lady Foley’s nephew, Mr. Paul Foley, inherited the estate, he indicated early on that he had no interest in the School, and following the Education Act in 1902, the County Council assumed responsibility, together with the Diocese, who provided religious education. Some 80 years later, the School was threatened with closure, and despite strenuous efforts by the Parish Council, closed at the end of 1986 and was left empty. The Parish Council requested permission to rent the School at a nominal cost as the Village Hall required refurbishment, but this was refused. Upon receipt of estimates for updating the Village Hall, however, the County Council agreed to pay£17,000.- from proceeds of the sale of the School, and in June, 1989, the buildings were offered for sale by tender for a figure in the region of £190,000.-, the County Council and the Diocesan Board of Finance being the vendors. At that time, Stella Bradstock was Chairman of the Parish Council, and she and her fellow-councillors felt that the sum of £17,000.- was not enough. Stella also happened to read an article in The Field detailing Lord Denning’s involvement in a similar case in Whitchurch, Hampshire, and the Parish Council wrote to Lord Denning, outlining the local situation. An immediate reply was received from Lord Denning, hand-written, stating that the Parish Council had a good case, and that the sale of the School should be challenged by issuing a writ. This was encouraging, but also rather daunting as a solicitor would be required, with attendant unlimited costs. At this point, the Parish Council received an offer of help from Christopher Haan, a solicitor practising in London, who was born in Little Tarrington. Without Christophers help, the Parish Council could not have thought of proceeding. In correspondence Lord Denning continued to offer advice, and asked questions in the House of Lords regarding the validity of such sales. 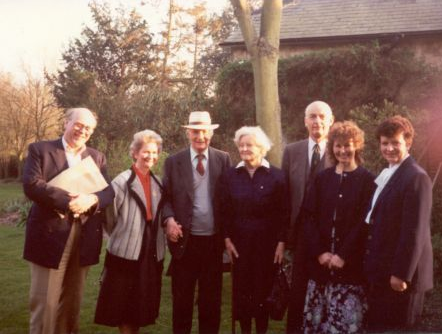 He also invited Stella to visit him and she, together with Pat Jenkins, Angela Stock, Peter Davies from Dormington and Christopher Haan, travelled to Hampshire to discuss the situation. Lord Denning advised that a writ be issued declaring the three parishes owners of the School buildings. This put the onus on the other parties to prove ownership and delayed the sale. The parishes should assume ownership by changing the locks, insure and maintain the buildings, find a tenant for the school-house and collect rent. This was duly done. (The rent enabled the playing field to be bought and covered insurance, and architect and barrister’s fees). The Department of Education and Science, on receiving notification of the writ, forwarded the letter to the Charity Commissioners, who confirmed that charity status was involved. At this point, the County Council backed out, but the Diocese proved more tenacious. 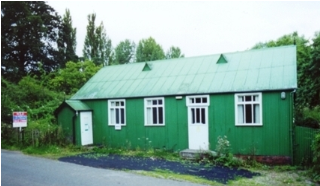 Details of proposed use as a Community Hall, with estimate of costs were submitted, and the challenge followed to prove that if awarded ownership of the School, there would be funds available to refurbish it for change of use. Hectic fund-raising ensued, a grant of £127,000.- was received from Malvern Hills District Council, and further funds came from the Rural Development Commission, South Hereford District Council, and Hereford & Worcester. Car-boot sales were also held in Ledbury Market, and a total of £200,000.- was raised. In 1995, papers were sent to the Treasury Solicitor with architectâ€™s drawings, stating that funds had been raised. An agonising delay of two years followed imperilling promised funds and incurring an increase of £25,000.- in building costs. Eventually in 1997, a hearing in the High Court made way for a compromise. The School would be the property of the three parishes and the School House of the Diocesan Board of Finance. The Court Order also decreed that the old Village Hall should be sold once the Community Hall was in operation, and the proceeds divided equally between the Diocese and the new Trust for the Community Hall. There was considerable resentment in the village that the Diocese should benefit in this way as the Village Hall had been built by public subscription, and at no time had the Diocese provided funds for the School. However, further protracted legal wrangling would only result in additional expense, and the Parish Council reluctantly accepted the compromise. This meant the actual building work could be started to convert the school building into a community hall for the village.